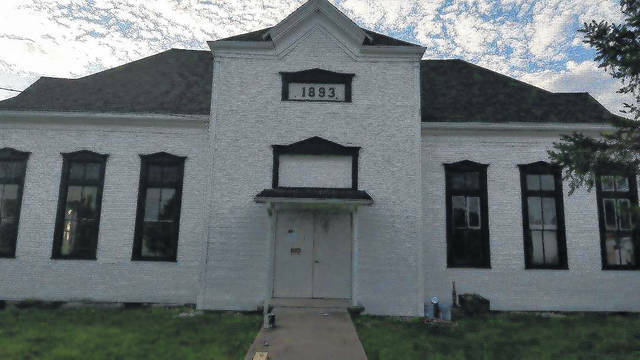 Vinton Village Hall, pictured, which has stood on Clay Street since 1893, is physically unchanged but is better for a new coat of paint both inside and out, window frames in black to stand out from the white exterior and interior, new carpet and other improvements. 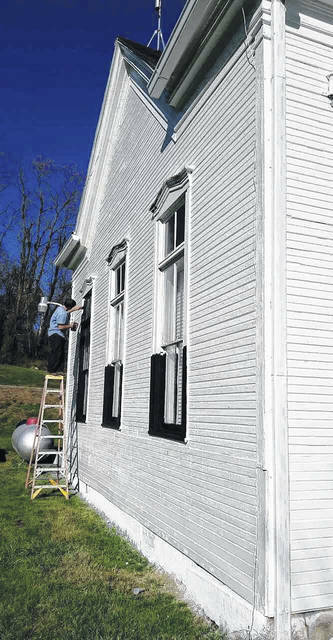 Workers “sprucing up” Vinton Village Hall. A look inside the historic structure. 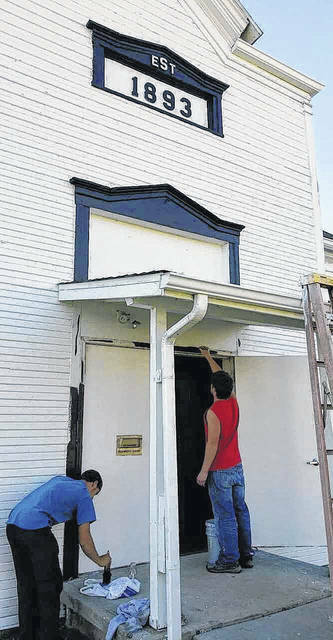 VINTON — One of the most historic buildings in one Gallia County community has received a fresh look thanks to the efforts of local government and volunteers. 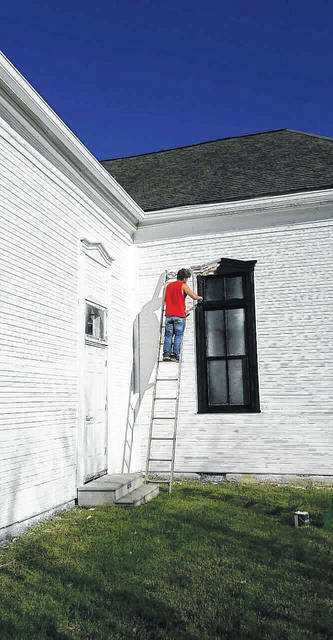 Vinton Village Hall, which has stood on Clay Street since 1893, is physically unchanged but is better for a new coat of paint both inside and out, window frames in black to stand out from the white exterior and interior, new carpet and other improvements. Exterior work was completed by Cherry Fork Construction of Oak Hill and interior demands were met by Denver Bates, the village maintenance man. Volunteer assistance came from Whealdon, his wife Brandi and others who donated time to the project throughout this fall. The mayor estimated the job cost between $18,000 and $20,000, financed by the sewer fund which allows for improvement to the structure housing administration of municipal wastewater collection and treatment. Vinton has had its own sewer system for more than a decade after breaking ground for installation in 2004. The need to put a new face on the village hall had been evident for some time, officials noted. 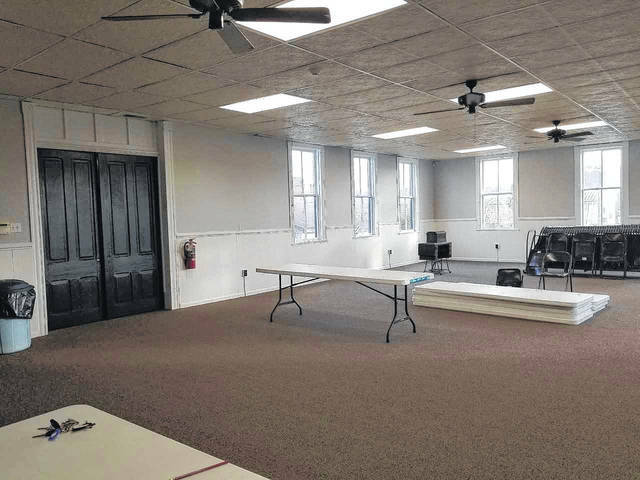 It’s a popular space for everything from parties and craft shows to flu shot clinics, and was at one time the largest facility for events between Gallipolis and Wilkesville. Secondly, the village plans to decorate the interior of the main meeting room with more illustrations of Vinton’s past. Photos of the village from the last century, especially one taken from the hill overlooking the town, reveal numerous homes and businesses surrounding the village hall indicating how busy Vinton once was. The mayor said that same photo shows the black framing for the building’s windows existed at the time it was taken. Additionally, American Legion Post 161 recently gifted the village with some of its own collection of local history to display in the auditorium. “Brandi has some ideas for dances and old-timey stuff in the future after we complete the project,” Josh Whealdon said. Founded with the establishment of a mill on Raccoon Creek in 1832, Vinton was incorporated as a village 50 years later, launching a period of growth and prosperity that lasted into the late 1920s. By 1892, the idea of replacing the one-room schools scattered around the community led to the creation of what came to be known as the Vinton School, which opened its doors to students in grades 1-8 on Sept. 25, 1893. High school was available at other locations until overcrowding forced the creation of Vinton High School in 1915. But because the high school did not have an auditorium or stage, the 1893 building served as the site for graduation, athletics and school plays. An later annex to the high school allowed for those activities to move back to the Jackson Street location. The old school was sold to the village by the board of education of the Vinton Separate School District on April 7, 1936, and has since served as the seat of local government and community activities. An open house was held on December 9th.